Although some students have the wonderful opportunity to be part of a school orchestra, the addition of a private teacher is an integral part of learning to play the violin, viola, cello or bass. The teachers listed here are ones Henry knows and has referred with great results in the past. Please call or email if you any questions about the teachers. If you are a teacher and would like to be on our list, please click here. Please select one or more instuments and locations to search. Serving the North Seattle area for all ages and skills levels. I offer lessons at my home in Bothell, and mainly teach beginning to intermediate students. Violin lessons for all ages and levels in Shoreline. I am an active as a soloist and chamber groups� performer, teach private lessons and group classes, freelance with local orchestra, play and record with a group of folk singers in Seattle and Canada, and score music for full feature films. I possess a unique diverse skill set as a strings educator, which gives my students access to the full array of teaching techniques to realize their music potential. Patrick Austin is teaching in Redmond and Fremont. He began violin studies with his grandfather at age 5. During his youth he won several competitions and honorable mentions. In 2007 he won the Don Bushell Concerto Competition. Patrick was awarded a performance with the Seattle Philharmonic. He attended Mannes in NY for his Bachelor’s degree. Patrick has been teaching the violin for the past 19 years and is a certified Suzuki Teacher. Patrick is currently accepting students of all ages. Issaquah, all ages and abilities. Renton and Gig Harbor Wa Teaching violin students of all ages and abilities. Renton and Gig Harbor Teach cellists of all ages and abilities. Certified Dalcroze teacher, offering Dalcroze classes and workshops. I teach students of all ages and abilities from my home in Woodinville on the Eastside. Located in Renton. Retired Symphony violinist who specializes in nurturing young students. Learning music is fun at Mrs.”B”s! She turns learning to read musics (symbols) into an exciting game. Research is showing that playing music gives you brain a complete work out. Did you know that scientists can identity the brain of a professional musician? I teach at my home in Bothell and live directly next to Canyon Creek Elementary and Skyview Middle School. I prefer to teach beginners at age 7, because they can read and therefore reading music is easier for them. I do teach up through high school..
After completing my doctorate in music, I relocated to the Seattle area in September 2015. I am currently building a studio from my home in North Seattle, working with students of all ages and abilities. For my complete biography, please visit www.skyrosquartet.com/willie-braun. Redmond, Bothell and Monroe studio locations and In-home lessons also available. English/Chinese and optional ABRSM track available. I holds a BM from the Wheaton Conservatory, IL and an MM degree in violin from Cal State Sacramento. He has taught and performed in China for four years and now locally. In addition to the standard western repertoire he also enjoys exploring jazz and traditional Chinese music. I'm currently accepting new students age 3 to adult, beginner to advanced. Issaquah, Maple Valley, Enumclaw. Violin, Viola and 18 other instruments. A rare opportunity to study with a Juilliard trained concert cellist. I offer cello lessons in Issaquah and Redmond. Please contact me to schedule an interview audition to get started! Mills Music studio in Monore, Washington Home lessons with special arrangements, Snohomish, Sky valley area. I am currently accepting private cello students of all ages, beginning through advanced in Vancouver (Salmon Creek). Capitol Hill, Seattle. I have teaching experience with young children, adolescents, and adults. I teach classical music, Irish fiddling, and Suzuki pieces. I love to help students find their own potential and discover the music that excites them. My main goal is to help students identify what about the violin moves and inspires them -- that's the best way to make music stick! All ages (kids and adults) are welcome at my Burien studio. Teaching in the Kirkland area and Mercer Island I welcome both children and adult students. Classical and Old Time Fiddle. My home studio is now located in Redmond. I offer in home lessons as well as ensemble sessions. I am a Cello Teacher and musical artist in Leavenworth, Wenatchee, and Seattle WA. My approach as a teacher is broad and open with roots in tradition but with a leaning towards a more modern musical training that welcomes improvisation and exploration off the page. I teach in my home in Bellevue. Studios in Northwest Seattle, Tacoma, Auburn, Sammamish/Issaquah K-12, all levels, College students and Adults welcome who want to improve their technique and confidence Master’s in piano and strings, Doctorate in viola performance I like to incorporate physics, history, etc. into my teaching! I am willing to go to a student's home in Edmonds, Lynnwood, or Mountlake Terrace in addition to teaching in my home in Edmonds. I teach Suzuki method and can help with fiddle styles as well as students getting instruction from the public schools. Leschi/Madrona/Central District Teaches beginning to intermediate children and adults. Preference if students are available to come to home studio. (Does make some exceptions). Seattle, Capitol Hill, Bremerton, Tacoma. I teach students of all levels. I do not use the Suzuki method, but concentrate on the traditional methods. I specialize in preparing young students for competitions, and entrance into colleges and conservatories. Seattle / East Side I teach all ages and levels of cellists. I teach in my studio in Seattle and also travel to homes on the East Side once a week. Professional violist offers viola and violin lessons from beginning to advanced students. Will travel to your home or teach in my studio on Columbia City. Studios in the North Seattle (Bitter Lake) area and South East Everett. Beverly has been teaching the violin for more than 30 years. She has developed a highly effective personal approach to learning this wonderful, albeit challenging instrument. She maintains a positive, fun atmosphere with clear, detailed instruction, and at the same time, never loses sight of the classical disciplines necessary to take your violin skills in whatever direction you choose. Professional cello instructor with the greatest passion and patient offers one on one teaching on weekly basis, willing to help any cellist from A to Z. Suzuki method for 4 years old and up. Serves on the east side, studio is located WA98072, Woodinville/ Bothello/Kirkland/Redmond area. I teach out of my home in Carnation WA. Though violin is my primary instrument, I teach all four string instruments. Studio located one mile west of Bellevue Square Mall, near Medina, Clyde Hill and Bellevue. Easily accessible from Kirkland, Redmond, Seattle and Renton via 520 or 405. Lessons for beginning and intermediate violin and viola students, ages 4 and older. I teach kids ages 3-18 in Wallingford. I teach beginning to advanced students of all ages, all styles of music. Bothell, Kirkland, University District, Issaquah. I teach at Foothills Music Academy in Woodinville. I teach violin and viola from beginning to the intermediate level and beginning cello and teach both kids and adults. I work with orchestras in the Northshore Schools and have worked with Cascade Youth Symphony's summer camps along with being a long time member of Orchestra Seattle. Lessons also available in the Bothell/Woodinville area. Studio located in Renton Highlands. I teach age 3 -103 and beginner through advanced. My training includes Suzuki teacher training, a bachelor's degree in Music Education, and over 16 years private teaching experience. Beginners through advanced. All ages. Teaching the fundamental structure for instruments. Bellevue Factoria area. In-home teaching in Seattle and Bellingham as well as lessons at my studio in Sedro-Woolley, serving the Skagit County area. I accept cellists all ages, all levels. Students come to my home in Renton, about 12 miles south of Bellevue. I have over 40 years of teaching experience, and previous students who are now teaching privately and in the school systems both here in Seattle and in Virginia. My training is from the old Russian School. Edmonds. I enjoy teaching all ages, particularly Jr. High and High School through adult. Home studio in Maple Leaf neighborhood of Seattle near U. of WA. College credit for harp through North Seattle Community College. Background: BM and MM Eastman School of Music. Received George Eastman Scholarship. Additional study in Munich 1 year with Concertmaster of Munich Philharmonic Orchestra and 2 solo recitals in Europe. Radio, television and Seattle Opera House appearances. Nine years private lessons harp with a former Harpist of Seattle Symphony. Teaches: all levels and ages violin and viola; beginning piano; harp to Upper Intermediate level. Directs volunteer youth Serenaders ensemble visiting elderly facilities, Childrens Hospital, etc. I love to teach those who love to learn music. Equipping and nurturing musicians of all ages to excel, engage, create and soar! Specialties: Classical, Improvisation, Worship. Studio at Kaleidoscope School of Music in Issaquah, and home studio in Maple Valley. Background: M.M. in Violin Performance from the St. Louis Conservatory of Music, B.M. North Park University; over 20 years teaching experience including Kenyon College and various other music schools nationwide; extensive and ongoing solo, orchestral and chamber music experience. My students have gone onto careers in music, as well as study for enjoyment! I teach at my home in Kenmore, at Mills Music in Bothell, and at North Seattle Community College. Ages 4 to 84. Beginners to advanced levels. 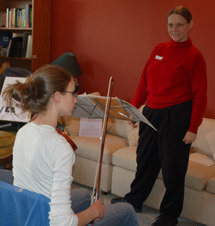 Dr. Kelley Johnson teaches violin, viola, group classes and chamber music in her Klahanie/Issaquah home studio. Students come from the greater Seattle, Washington area. Students in this studio tend to be focused and goal oriented students who want to improve their musical and technical skills in order to tackle youth orchestra auditions, school orchestra placement, all-state auditions, solo and ensemble competitions, and college auditions. I do lessons in your home in Snohomish County as well as in my studio located in Kennelly Keys on Evergreen Way. My FaceBook page is Singing Strings. Accepting violin students ages 3-18. Studio located in West Bellevue. Redmond / Eastside I am a registered Suzuki teacher and have experience teaching all ages and levels. I am currently accepting students age 3-17. I am currently accepting a limited number of new and committed students who are between 3 and 5 years old. Lessons are held in the Madrona neighborhood of Seattle. I teach students of varying ages and skill levels. Violin & Viola. Certified Suzuki teacher,, teach ages 3+. Also teach traditional style lessons. My studio is in Mount Vernon, but I will travel to nearby areas (Anacortes, Bow/Edison, Arlington) if there are two or more students taking lessons in that area. I teach in Burien from my music studio. I've taught for over 30 years in the same location and teach violin, viola, all levels, all ages. I also conduct two youth orchestras - Normandy Park Youth Orchestra, and Normandy Park String Orchestra. Redmond, Wa. Accepting students of all ages. Throughout the greater Puget Sound Region. To make it easier for consistent lessons, I teach students in their homes. I teach anywhere from beginners to intermediate in the greater Puget Sound and the eastside. I primarily teach either at my house or I can come to a location of your choosing. North Seattle, in-home studio. Violin and viola students of all ages, including adults. I offer Suzuki Method and traditional approaches with humor and care. Everett/Lynnwood/Bellevue Kennelly keys stores where I have taught since 2002. BA in Music, professional musician. Studied with Robert Meyer, principal bassist BBC orchestra, Moscow Symphony. I come to your home and teach in Redmond, Sammamish, Snoqualmie, Bellevue, Issaquah, Mercer Island, Renton, Puyallup, and Tacoma. Ages 4 and up. I have over 30 years of teaching and performing experience, and currently perform in the Tacoma Symphony. I teach cello in the Capitol Hill area of Seattle (don't worry there's parking!) I teach students technique fundamentals, rhythm, and musicality in a positive environment. All ages are welcome using a combination of Suzuki and other methods for a well rounded student. My home studio in Kirkland. Beginner and intermediate players welcome! Greater Seattle within 5 miles of my Columbia City home studio. Seattle - Queen Anne, Magnolia, and Belltown. Whidbey Island, including Clinton, Langley, Freeland, Greenbank, Coupeville. teach beginners through the most advanced on violin and viola. Doctorate in Music from Eastman with certification in pedagogy Master in Music from Rice University Bachelor of Music from the Cleveland Institute of Music Specializing in pre-professional training and preparation for conservatory auditions. Although we do not sell any instruments, we have several excellent instructors at both our Kirkland and Redmond locations. Matthew Olson is the Director of the Olson String Studio with locations in Queen Anne and Mill Creek, WA. He received his pedagogical training from top Suzuki Method educators including William Starr and Edward Kreitman. He was fortunate to study with some of the world’s finest teachers including Almita & Roland Vamos, Ruggiero Ricci, Benny Kim, Zakhar Brohn, and Dorothy DeLay. He has been playing since the age of three and has performed as a soloist, chamber musician, and orchestral musician across the country and abroad. He was the youngest Concertmaster of the Kansas City Ballet Orchestra and has been Associate Concertmaster and Assistant Concertmaster of several orchestras and chamber orchestras. Matthew has also been the Musician-in-Residence for the Orcas Island Chamber Music Festival. I teach on the Eastside. I specialize in teaching beginners, but had experience ( 9 years) with a wide range of ages and abilities. I teach viola, all levels, age 13-adult, and violin, beginning/intermediate level, adults only. Lessons are in north Tacoma through the University of Puget Sound's Community Music Department. I teach Viola and Violin, ages 4-400 in Bellevue and Sammamish. I am a Suzuki Teacher with 30+ years of experience. I offer Quality technique and musicianship in a nurturing environment. Private and group lessons are available weekly. Please read my website, then call to schedule an observation. Thank you for your interest. I teach in Wallingford (out of a home studio) and Ballard (at the Suzuki Institute of Seattle). I hold degrees in violin performance and Kodaly pedagogy. I have a studio on North Mercer Island where they offer violin and musicianship/music theory lessons. I teach in the eastside at Music Works Northwest (425-644-0988). Currently I accept students from age 7 on up up to adult. Instruments: violin, viola, piano and voice	Location: I teach in my studio on Bainbridge Island. I teach all ages, abilities, styles and love to work with your inspiration. Eastside - Bellevue/Kirkland Accepts students of all ages and levels - can train for auditions (competitions/school auditions/orchestral auditions). Please visit website for bio and more info. I live in Woodinville near Cottage Lake, I teach Violin and Viola. Greater Seattle and Eastside as well as Tacoma. I am located in Redmond and convenient to Kirkland, Bellevue, Woodinville. I bring more than 35 years professional experience to my teaching, from orchestra to opera to quartet, from Los Angeles to Italy. This infuses my teaching with a flavor, depth and knowledge that can only be obtained through experience itself. I am certified to teach music by the Board of Regents of the State of New York; my Curriculum Vitae is available upon request. I welcome beginners and students 8yrs and up. I teach beginning to advanced students from the north Seattle area, Edmonds, Lynnwood Bothell, Kenmore and Kirkland. I teach lessons in my home in Shoreline. A convenient location near the freeway. We are Shari Link and Linda Scott at Seattle String Studio in Lake City. We teach violin and viola lessons ages 5 through adult. We also have group classes for our students. Our fee is $30 for 30 minutes, $45 for 45 minutes. $60 for one hour. Island Strings is a network of strings teachers located on Whidbey Island, Washington. Founded in 1974 by Linda Good, Paula Pugh, and Linda Morris, Island Strings provides instruction on violin, viola, cello, bass, guitar, piano, recorder, banjo, dulcimer, and harp. Island Strings students can take private and group lessons, participate in masterclasses and workshops, the Gold Note Festival, the Young Artists Concerto Competition, and studio recitals. Studio: 3323 E Harrison St. Seattle,WA 98112 Dr. Jaein Shin received Bachelor,Master, and Doctorate degrees in violin performance and education from Yale University and UW. Jaein performed solos at Carnegie Hall and Benaroya Hall, and often performs live on national television and radio. She also played both as a concertmaster and a soloist with many orchestras such as Seattle Philharmonic. Jaein taught at Yale University, Bellevue HS and teaches violin and viola. Seattle, Wallingford/U District/Greenlake area Classical, jazz, tango, latin and folk music lessons for young musicians and those young at heart. I teach out of a performing arts studio on Snoqualmie Ridge called Big Star Studios. I was hired to spearhead their string program. I am actively seeking more private string students as well as string youth looking to be a part of a brand new chamber music program at Big Star. In addition to this, I am starting a small adult chamber orchestra! If any folks in Issaquah or Snoqualmie Valley are looking to avoid the commute into Seattle to play, contact me! If you would like to learn the violin, viola, or cello, StringsPlay Studios has a sweet setup! I received my degree in violin performance from DePaul University and went on to perform in concerts with the Bangkok Opera, Bangkok Symphony and other orchestras, as well as giving public recitals. In addition to performing, I have taught for over ten years - during which time I worked as the Head of Strings at the Regent�s School, a prestigious international prep school in Bangkok, Thailand. My students have gone on to study at institutions such as the Royal Academy of Music in London, England and to play with the Bangkok Symphony. Locally, I have students playing at all levels in the BYSO orchestras. I am currently accepting students of all ability levels and ages at my private studio in Kirkland (Kingsgate area). Each month, students will be given three private lessons followed by a monthly masterclass. Lessons can vary in length depending on the student, and are taught weekly. Please review my website for more information, and call to set up a time to interview/audition for a place in the studio. I teach at my home studio located in Southeast Seattle, just off of Othello St. in Rainier Valley. It easy access from Columbia City, Seward Park, Beacon Hill, West Seattle, Burien, and Renton. I am a Suzuki cello teacher accepting students ages 4+, beginner, intermediate, and advanced. I also enjoy working with adult students. In my home, northwest Bellevue. I have a Master\'s in Violin Performance and am a trained Suzuki teacher. My students range in ages from 4-15 in all levels and include non Suzuki materials. Violin and Viola teacher offering in-home lessons throughout the Eastside and North Seattle areas. Primarily Suzuki method, supplemented with many other materials. Age range of current students is 3-13 though all ages and skill levels are welcome! B.M. The Boston Conservatory; M.M. The Jacobs School of Music, Indiana University. Mercer Island. Accepting students 1st grade through High School. My studio is located in NE Seattle (Wedgwood) 10 minutes from the University District. I teach students of all ages and abilities. I teach beginning to advanced students, children to adults out of my home studio located in Redmond. Please visit my studio website for more information. I teach Traditional Fiddle music to beginners through professionals. Emphasis on style and repertoire, ear training and theory and having fun. Seattle, Bainbridge Island and East side. I do home visits as well as teaching at my studios. Bellevue location - Bridle Trails area. Close to 405/520 Interchange. I take beginning through college. I use traditional methods (no Suzuki) we learn to read notes and count right away. I believe in enjoying music and learning the joy of hard work . I work with serious students. I can help you if you are struggling in school, but you will have to work for me. I have an undergrad and masters in performance (Whitman College, UW) and more than 20 years experience teaching. My students play in SYSO and BYSO. I am currently on MITC staff. My major teachers have been mostly Russian trained. I understand that not everyone who wants to play well wants to do this for a living. When we meet, tell me your goals and we will make a plan to get you to the level that you want to be playing at. I teach out of my home in Buckley. My students come from Bonney Lake, Auburn, Enumclaw, Wilkeson, and Puyallup. I specialize in teaching private violin and viola lessons to kids aged 4 and up. Belleview, Kirkland Redmond, Bothell, Mill Creek, Kenmore. All age groups, beginners to advanced. Issaquah Highlands - I have 28 + years of solid violin teaching experiences. expert in Suzuki method and classical violin teaching. more than 15 years of Orchestra and Chamber music playing. I can travel to your home in the Issaquah Highlands area.